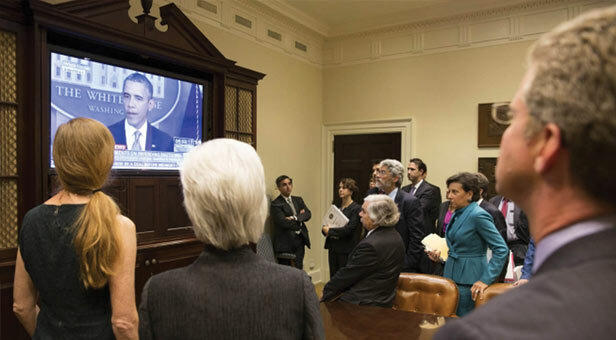 Cabinet members look on Monday as Obama discusses government shutdown (White House Photo by David Lienemann). WASHINGTON, D.C. (NNPA) – Although the shut-down of the federal government that began Tuesday is affecting all Americans, a disproportionate portion of the 800,000 furloughed federal workers are African Americans, according to the U.S. Office of Personnel Management. Overall, people of color re-present 34 percent of the federal workforce. Latinos are 8 percent of government workers, Asians are 5.8 percent, Native Americans are 2.1 percent and Native Hawaiian and other Pacific Islanders are 40 percent of federal employees. People of color are 37 percent of the U.S. population, a figure projected to grow to 43.3 percent as soon as 2025 and 57 percent by 2060. President Obama added, “I also want to be very clear about what would change. Office buildings would close. Pay-checks would be delayed. Vital services that seniors and veterans, women and children, businesses and our economy depend on would be hamstrung. Business owners would see delays in raising capital, seeking infrastructure permits, or rebuilding after Hurricane Sandy. Veterans who’ve sacrificed for their country will find their support centers unstaffed. Tourists will find every one of America’s national parks and monuments, from Yosemite to the Smithsonian to the Statue of Liberty, immediately closed. And of course, the communities and small businesses that rely on these national treasures for their livelihoods will be out of customers and out of luck.